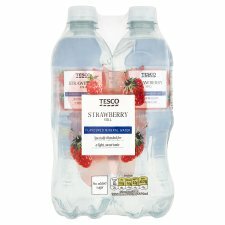 No added sugar still Strawberry flavoured mineral water soft drink with sweetener. INGREDIENTS: Natural Mineral Water, Citric Acid, Flavourings, Preservatives (Potassium Sorbate, Dimethyl Dicarbonate), Sweetener (Sucralose). Keep cool and out of sunlight. Once opened, consume within 3 days.